They'll be joined by entry-level F50 alternatives, too. Hear the name Technics and you'll probably jump to thinking about the brand's top-notch turntables. 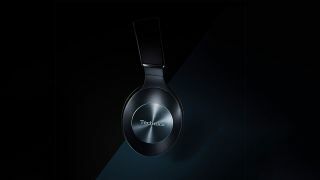 But at CES 2019 the company is pushing the sounds straight into your ears with its new over-ear headphones, the Technics EAH-F70N and EAH-F50B. Suitable for high-resolution audio playback thanks to support for LDAC and apt-X HD standards, both make use of 40mm dynamic tuned to maximise bass impact, "realistic dynamics" and "spatial ambience". The F70Ns are the more premium cans however, taking advantage of a "Hybrid Active Noice Cancelling" feature, which makes use of mics located both on the exterior of the headphones and near to the driver to offer three different levels of ambient noice cancellation. It also has an "Ambient Sound Enhancer" which can be activated to let exterior sounds (such as train station announcements) pierce through your tunes on demand, making sure you're aware of your surroundings when required, too. Made from aluminium, each set of headphones also comes equipped with smart sensors that know when you're wearing the cans, pausing playback when you take them off and resuming the tunes when you pop them back onto your head. Connecting over Bluetooth, you'll get 20 hours of playback from the F70N and 35 hours of playback from the F50B from a four hour charge. Both also come with a cable to plug your playback device in when your battery runs dry. No word yet on release date or pricing details, but we'll be sure to update this story once we've got it.